2017-12-14 Kashrus Alerts are available for download. 2017-11-22 Kashrus Alerts are available for download. Empire Kosher® is committed to producing the highest quality products and our top priority is the safety of our consumers. Unfortunately, due to an equipment malfunction certain of our boneless chicken breast products have the potential to contain a piece of extraneous material contamination [broken metal]. Out of an abundance of caution we are issuing a voluntary recall for five products with identified sell by dates manufactured in one of our facilities (USDA-FSIS Establishment P-1015). There have been no reports of illness or injury associated with this issue. The affected lots of Empire Kosher® Boneless Skinless Chicken Breast were distributed to select Costco, select Trader Joe’s, and select Wegmans stores only. No other retailers received these products. If you have product that is a part of this voluntary recall, we apologize for any inconvenience and concern that this may have caused you. We are available to assist you at 1-800-570-5718 Monday–Thursday 9:00 AM – 7:00 PM and Friday 9:00 AM – 4:00 PM. During this time, we can arrange to send you a refund or a coupon for product replacement and instructions to discard the product. 2017-10-17 Kashrus Alerts are available for download. 2017-09-19 Kashrus Alerts are available for download. * On 9/27/2017, the 9/19 alerts were updated to replace the prior 9/18 version. 2017-09-19 Kashrus Alerts are available for download. * On 9/27/2017, the 9/19 alerts were updated to replace the prior 9/18 version. 2017-08-29 Kashrus Alerts are available for download. is now available at One Stop Kosher Market. See a store cashier for your copy! The Star-K has advised that due to infestation conditions of the fields, it will not be certifying any Dole Iceberg salad this week, and this will likely extend into next week. Consumers will therefore find that the newer bags of Dole Iceberg salads now in stores do not bear the Star-K symbol. This also applies to several other brands such as Fresh Selections [Kroger], Little Salad Bar [Aldi], and Marketside [Walmart]. The Star-K also advises that even under normal circumstances, there are usually a few lots of salads a week that are not certified due to infestation, and are still sold nationwide without the Star-K symbol. Every bag should always be checked for the Star-K symbol. 2017-7-27 Kashrus Alerts are available for download. Please report any problems with these extensions to operations@cordetroit.com. 2017-06-28 Kashrus Alerts are available for download. The K-COR strongly recommends that Slurpees be bought only at stores that have store-level Kashrus supervision of their slurpees, to be assured that the syrup box that feeds the machine is actually Kosher and pareve. 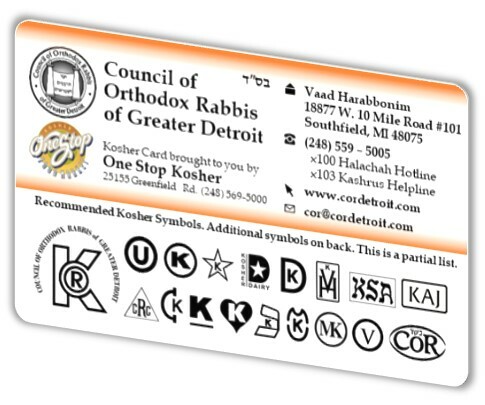 The flavor cards on the machine cannot be relied upon, even if they bear a Kosher symbol, because stores sometimes use syrups that do not correspond with the brand or variety posted on the machine. In addition, when changing flavors, stores generally do not clean the machine in-between, and during the transition there can be a significant mixture of flavors, one of which may be non-Kosher or dairy. Lincoln & Greenfield: all three machines. 11 & Coolidge, 13 & Greenfield, 11 & Lahser and 12 bet. Greenfield & Coolidge: only the left machine. 5/28/2017 Kashrus Alerts are available for download. Bags of DOLE CLASSIC ICEBERG (dated 05-16-17) and DOLE SHREDDED LETTUCE (dated 05-14-17) without a Star-K were mistakenly sold today (and possibly yesterday) at One Stop Kosher Food Market. These should be returned for refund or exchange. As posted last week, extreme weather conditions in California have caused an increase in insect infestation, which has reduced the availability of Star-K certified product. This applies to Dole brand, Fresh Selections [Kroger], Little Salad Bar [Aldi], and other brands. Each bag should be checked for the Star-K symbol. The Star-K should hopefully reappear within 1-2 weeks.